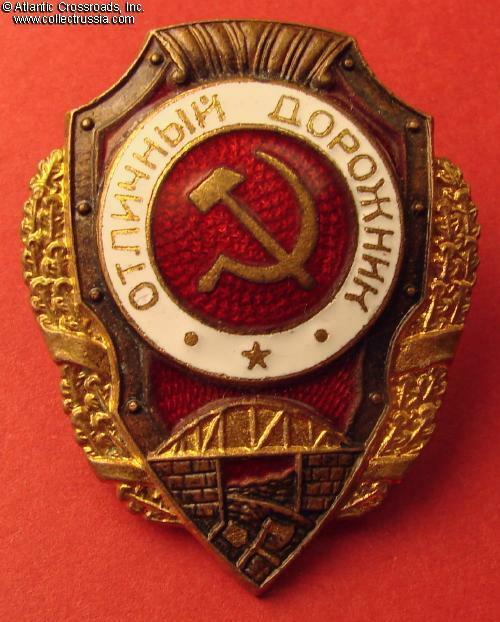 Excellence in Road Construction Badge, circa mid-1950s. Brass, enamels; 45.9 x 36.6 mm. 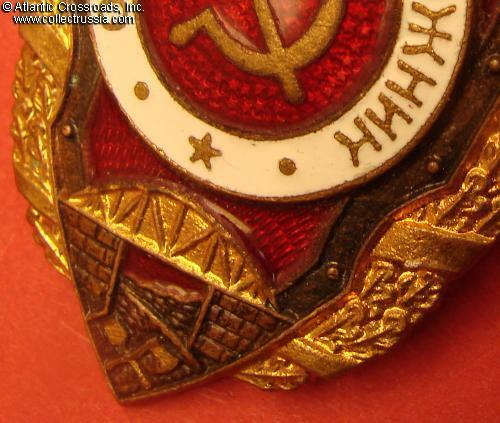 Scarce 1950s variation by the Pobeda Factory featuring sharply defined triangle in the center of the ornament above the center medallion. The bridge does not have horizontal "bars" inside of it, unlike the more common later version by the same Pobeda manufacturer. 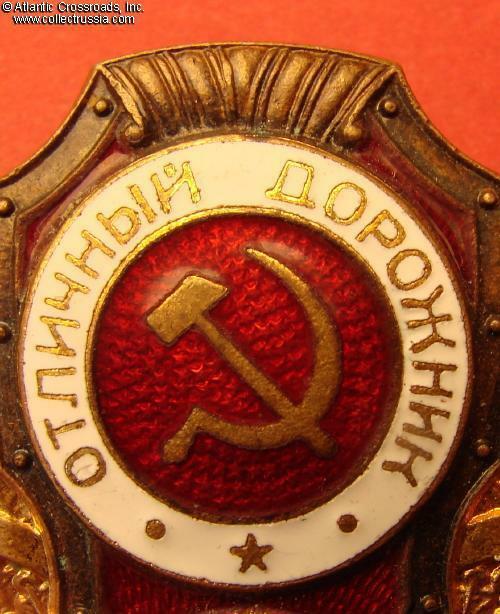 An interesting feature of this badge is the pattern of "dashes" under the red enamel immediately above the bridge: it's diagonal to the right of the bridge and vertical to the left. 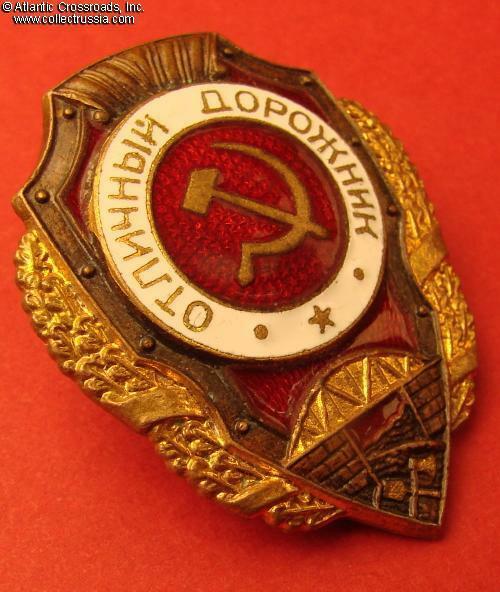 This particular version is not mentioned in the "Breast Badges of the Red Army" by Airapetyan but is shown in the reference guide "Breast Badges for Excellence in the Red Army, 1942-1957" by Khlamkin (classified there as Type 10). In outstanding, excellent condition. The enamel is practically perfect having only a few microscopic contact marks, no visible flaking or other significant wear. The original fire gilt finish is exceptionally well preserved and bright on the wreath, bridge, ax, and spade. The details are pristine and crisp. There is attractive patina on the reverse but the gilt is nevertheless fully present and clearly visible. 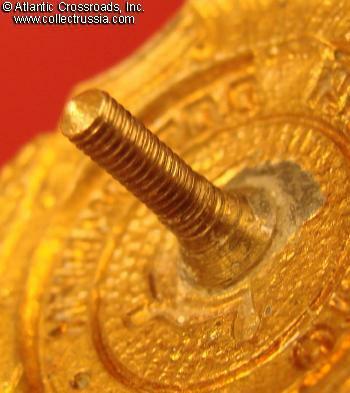 The screw post is over 11.5 mm long, has not been shortened. 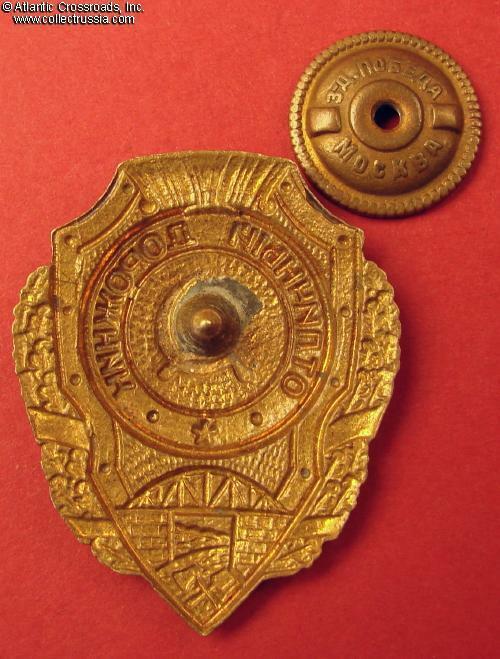 Original screw plate marked "Pobeda Factory, Moscow" is included.